Join Us!!! We are looking for someone to help us cover Burundian basketball. Please send us an e-mail. 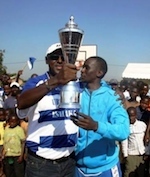 AC Genocide organized a basketball tournament in the memory of the vitims of the genocide of Burundi.The tournament was won by Gazelles who beat Berco Star by nine points , while Club Urunani was edged by New Star 58-57.In the beginning of the tournament, Dynamo clashed with Urunani and New Star was able to hold off Kern by one point, Gazelles scored nine points more to outscore CJS on last saturday. Patriots Basketball Club (D1) agreed terms with Burundian ex-international Jean de Dieu Niagunduka. He played most recently at Urunani in Burundian D1 league. Niagunduka was named to Burundian National Team in 2013. He was a member of Burundian Senior National Team since then. Burundis Urunani Basketball Club retained the Fiba/Africa Mens Zone V Club Championships title after beating hosts KPA 68-59 on Sunday at KPA welfare gymnasium in Mombasa, Kenya. In the womens category, last years first runners-up United States International University (USIU) of Kenya clinched the title after humiliating local rivals KPA 63-28 in the final. Urunani almost missed out on taking part in this years competition due to financial troublesonly making the trip on the last minute after the intervention of Burundis President Pierre Nkurunziza. It was the third successive year that the Burudian outfit reaches the mens final, having lost to Rwandas Espoir in 2012 in Kampala. They avenged by winning last years edition in Bujumbura after defeating Espoir. In the third/fourth spot play-offs, City Oilers of Uganda, who were in the same pool with Espoir, finished third after beating compatriots Tiger Head Power 71-67, while KCCA of Uganda also ousted Berco Stars of Burundi 69-61 to claim the third spot in the womens competition. Urunanis Elvis Hakizimana (85), who scored 78 points in five games, claimed the mens top-scorers award, while KCCAs Clare Lumunu was womens top-scorer with 111 points. Most outstanding players were Florence Kalume of Berco Stars and City Oilers Ben Komateh in womens and mens categories respectively. Most Valuable Players were USIUs Sarah Chan (women) and Landry Ndikumana of Urunani (men).